What is it with mankind, huh? Whenever it comes across someone/thing a little different that turns up on our radar, it feels the need to send in the white coat brigade with their probes, to prod here, there and did you really have to put it there?!. At least that’s how it comes across in films. 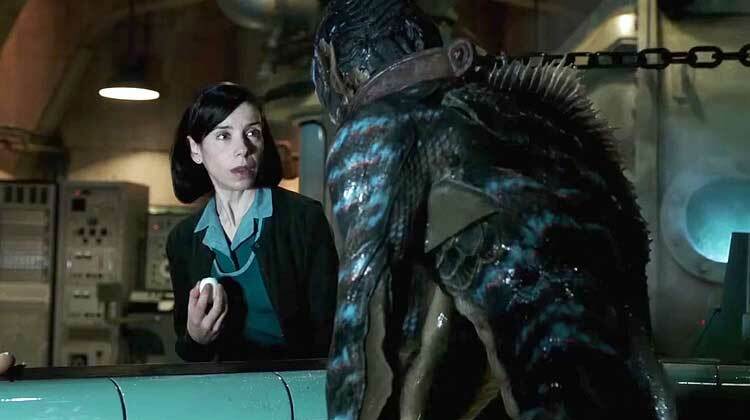 Director Guillermo del Toro pays homage to those creatures that have appeared on our screens before (who probably regretted it later, after all that probing), with this big budget B-movie. On second thoughts, i really should have bought a kitten. There are lots of things that spring to mind when you consider the goings-on inside a secret underground scientific facility, but its cleaning needs probably aren’t one of them. But think on this, they don’t clean themselves. Thankfully for Elisa Esposito (Sally Hawkins), the task of cleaning down all that granite grey and ceramic white keeps her, and her friend Zelda (Octavia Spencer), in gainful employment. 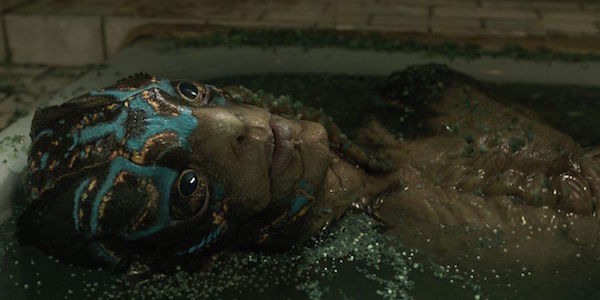 During one of her cleaning duties, Elisa comes across an amphibious creature (Doug Jones) in the base that has been captured, and as it is chained, kept against its will. Head of Security Strickland (Michael Shannon) is keen for him to remain that way, as he sees him as nothing more than a threat. Elisa though, sees him differently. Also, the fact that she’s mute helps considerably, as she manages to communicate with the creature using sign language. A secret relationship soon blossoms between Eliza and the creature, and she decides that there must be something she can do for him. And although she manages to recruit the help of scientist Dr. Hoffstetler (Michael Stuhlbarg), it certainly won’t be easy getting anything past the real monster on base - Strickland. One day i'll play one of the greats - like Godzilla or King Kong. As you would expect from this director, The Shape of Things is in itself a curious creature. At its heart, and it has a big one, it’s a simple love story. Woman meets sea creature, woman falls for sea creature, woman must fight to be with sea creature. It’s a familiar tale, and follows the premise of many a film before it. The most obvious is E.T, to the point where you half expect the creature to make his way out of the facility to find a pay phone to phone home. Sure, Elliott and the little fella never sucked each other’s faces, but besides that, it’s the same film. Albeit one with bits of Splash, Short Circuit etc. thrown in for good measure. And that’s where the film falls short. The one thing you expect from a del Toro film is originality, and this story has been told hundreds of times before. And yes, even better than this. What makes it worth seeing though are some strong performances, mainly from Shannon, who’s in good disturbing mode, and Richard Jenkins, who plays Elisa’s room-mate. And then there’s the creature himself, played by Jones, who must enjoy spending hours in the make-up chair, as he’s also currently playing the alien Saru in the series Star Trek Discovery. The cinematography and production design are also noteworthy, particularly if you like the look of scientific bunkers circa the early sixties. A fairly entertaining ride then, but as far as the overly familiar story is concerned we’ve really seen it all before, making it a somewhat shallow experience overall.